Soft tacos filled with chicken,topped with an avocado yogurt sauce and cheese - a winning combination! 1. Mash the avocado, in a small bowl, with a fork until smooth. Stir in the yogurt, coriander, lime juice and salt. Place to one side. 2. Heat the oil in a large frying pan and cook the chicken, over a medium heat, for 8-10 minutes. Stir until cooked. Stir in the taco seasoning and water, bring to the boil then reduce the heat and simmer uncovered for 3-4 minutes until thickened. 3. 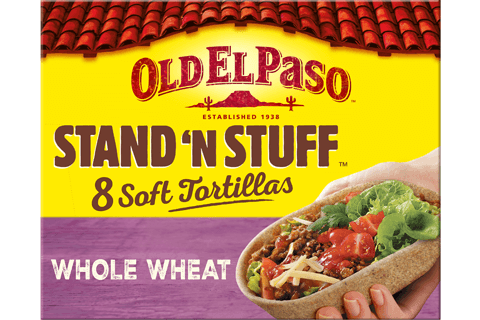 Meanwhile, heat the Stand ‘N’ Stuff tortillas to pack instructions. Divide the chicken mixture among the tortillas, spoon over the avocado sauce and sprinkle on the cheese. Garnish with coriander leaves and any other toppings of your choice. 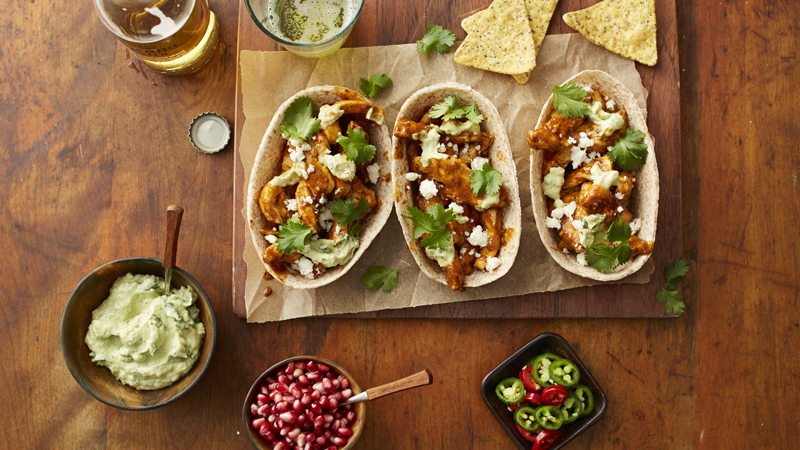 Jazz up these tacos with some pomegranate seeds, or sliced chilli. Serve alongside Old El Paso™ Original Nachips™.